The Mongols that live on the grasslands north of China in present day Mongolia have always been masters of horses. Their rapid conquest westward to the fringes of Europe is evidence of the skill in cavalry warfare (mounted archers) which no nation had an answer to. Genghis Khan took on the mission of conquering the whole known world; this vision took him as far as Palestine where the Muslim Egyptian kingdom managed to stem the tide. In China the Jin dynasty were forced to move their capital from Beijing to Kaifeng in 1215. The center of Chinese cultural activity had by then already moved south, the northern frontier lands were now sparsely populated with peoples which had become integrated with foreign, mainly Muslim tribes. Soon Northern China was attacked when an alliance of Mongols and Southern Song attacking Kaifeng and on defeat of the Jin established Mongol rule in northern China. Mercifully the million refugees in Kaifeng were spared slaughter, even though extermination was normally the fate of any who resisted the Mongol hordes (and 'horde' is the appropriate word as it is where the word originates). The Yuan (or Mongol) dynasty was declared in Zhongdu (now Beijing) in 1271. In the Chinese classic Yi Jing ‘Yuan’ means ‘Great Originator’ giving Genghiz Khan an important credential to justify his right to rule China. The overthrow of the Southern Song south of the Yangzi was delayed for fifty years by the death of Genghis Khan in 1227 and also by the physical barrier: the mountains and rivers of Southern China. The area controlled by the Chinese Song dynasty is shown with brown stippling on the map. The Mongols started an encircling movement to the west by capturing Tibet and Yunnan. The Chinese military system, little changed since the Qin dynasty was ineffective. Armies were raised on demand from the peasantry when needed, there was no permanent professional army. It was Kublai Khan, Genghis' grandson who eventually defeated the Song Chinese in 1279 to unify the whole of China under the Mongol dynasty. 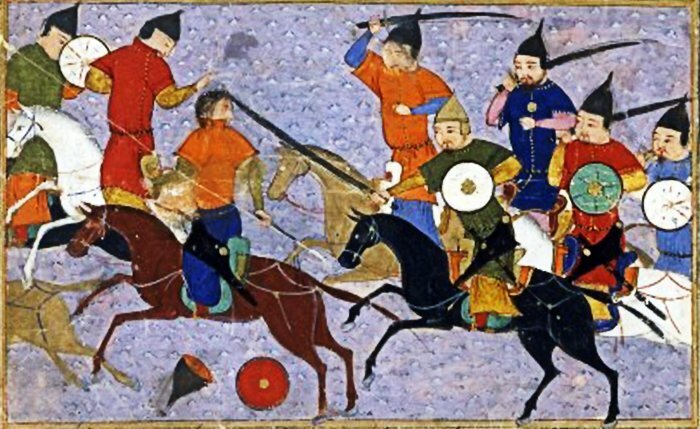 The Mongol's main military weapon was fear, when the Mongols threatened to massacre a city's inhabitants if they resisted conquest, they meant it. No city had successfully held out against them for long. The whole population of the city of Changzhou, Jiangsu, over a million people, were slaughtered in 1275. However attempts at further Mongol expansion to Japan; Java and Indo-China all failed. As the Mongols were hugely outnumbered by the Han Chinese, they could only govern through existing institutions and they became to some extent absorbed into Chinese culture. Battle between Mongols and Chinese (1211). Painted 1430. Image by Sayf al-Vâhidî. Hérât. Afghanistan available under a Creative Commons license ➚. The rule by a foreign people widened contact outside China and the Yuan dynasty is seen as a cosmopolitan era with a great mingling of cultures. The huge area from the Mediterranean to the Pacific under Mongol rule was split between Genghiz's descendents as four great Khanates. 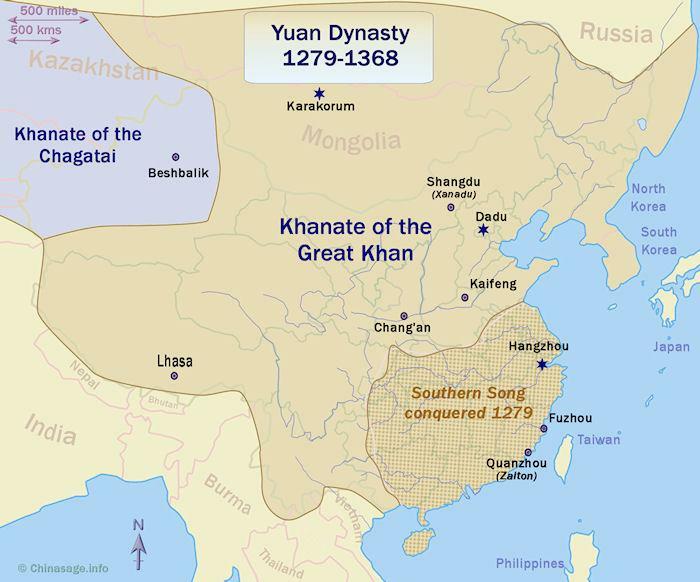 The khanate governed by Kublai was the principal ‘Khanate of the Great Khan’ as it covered the Mongolian people's heartland as well as China. The large numbers of foreigners brought to the Mongol court counterbalanced the power of the indigenous Chinese who could not then block the Khan's plans. Arabs, Persians, Venetians all provided new knowledge and technology that the great Empire utilized. People were divided into a hierarchy of classes of Mongols; Westerners; Northern Chinese and, lowest, Southern Chinese. Appointments went to the candidates of highest 'class' rather than merit. The conversion of the western Khans to Islam prevented a single Great Mongol leader ever emerging again because the Great Khan in China was classed as a Buddhist and therefore an infidel. The vastness of the Mongol Empire made exploration by Chinese adventurers and scientists possible; a number of important journeys were made and recorded. At this time Marco Polo lived in China, and the tales of his travels provoked huge European interest in this fabulous far away land of ‘Cathay’. Marco Polo reported on many unusual scenes including one where that the Great Khan traveled on a great wooden room built on top of the backs of four elephants. The Mongols moved the Imperial capital for the first time to the site of present day Beijing (then called Dadu - Great capital or Khanbaliq ➚). A number of large infrastructure projects began. The Grand Canal was extended north from the Yellow River to Dadu. A paved track between Hangzhou and Beijing alongside the canal cut travel time for Imperial messengers to travel the 435 miles [700 kms] in only 40 days. The famous blue and white porcelain began to be produced now that there was access to the blue cobalt glaze from Central Asia. The Mongols promoted the cotton industry as an alternative textile to silk. A new astronomical observatory was set up with foreign help and new detailed maps of their extensive territories were produced. An alternative capital to escape the summer heat was built at Shangdu (Samuel Taylor Coleridge ➚'s ‘Xanadu’) on the Mongolian plain and the whole Imperial court moved between the two sites. Administration was somewhat hampered by the continued use of both Mongolian and Chinese language and culture. The ancient Civil service examination system was suspended until 1315, appointments of officials was made by patronage rather than intellectual merit - the military always had the upper hand. However, many of the efficient parts of the administrative system of China were maintained. The punishments for crimes were rather strangely made less severe giving strong evidence for the cruel and deterrent nature of the Chinese criminal system. The Sinologist Arthur Waley ➚ has described the influence of the Mongols as ‘merely policemen’, the Chinese systems (tax, justice, welfare etc.) continued unchanged beneath the numerically tiny Imperial Mongol court. The excessive expenditure of the Emperor (attacks on Cambodia, Japan etc.) did however bring a burden of high taxation and inflation. An old palace building at Beihai Park, Beijing. 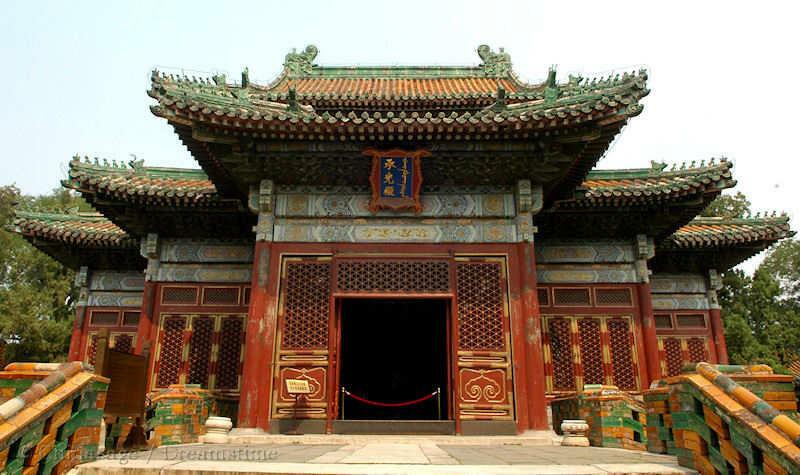 Kublai Khan redesigned the existing park and built a palace here. Temur Oljeitu ➚, Kublai's grandson maintained the Empire's peace and prosperity but after his death in 1307, seven weak rulers followed in just 26 years. Divisions within the Mongol aristocracy fueled the decline in stability. The emperors did not rule long enough to establish themselves and their successors typically reversed their predecessor's policies. A return to Mongol brutality advocated by Bayan of the Merkid ➚ (for instance massacring all Chinese with certain surnames, which would have amounted to 90% of the population) was not carried out. The resentment of 'foreign' rule continued, but it was really the Black Death ➚ that heralded the end of Mongol control of China and the beginning of the Ming dynasty. Together with Qin Shihuangdi; Zhu Yuanzhang and Mao Zedong, the Mongol Emperor Genghiz Khan is one of the few men to individual influence the shape of modern China. Portrait of Genghis Khan. Painted in the Qing dynasty. Ink and color on silk. From Online Collection ➚ of Brooklyn Museum ➚, 2005, available under a Creative Commons license ➚. Genghiz or Genghis Khan had a vision that propelled him to seek to bring all of humanity under one unified kingdom. At the time, the nomadic people of Mongolia were divided into many tribes with strong family loyalties. Genghiz's first great achievement was to unify the Mongols under himself as the one great Khan (or ruler) in 1206. Genghiz lived through hard times as a boy, after his father was murdered the family had to subsist on wild plants and the occasional mouse. For a while he is believed to have served as a mercernary in a Chinese army. Soon enough, under his leadership, the massed horde of Mongol warriors on horseback became an unstoppable force wherever they went. After five years he began an invasion of northern China with an army of 200,000. Northern China at this time was under the control of the Jin dynasty and the Western Xia kingdom. China's Great Wall had not been maintained and it proved little obstacle to his advance. The 150,000 strong Chinese army and formidable city wall defenses could not repulse his attacks for long. Two armies attacked and besieged Beijing (at that time called Zhongdu) in 1214-15 and the city was systematically looted and burnt to the ground. His tactic for conquest was simple: ‘surrender or die’. If a city held out against him, then all the inhabitants were put to the sword. In some conquered kingdoms (such as the Western Xia) it is estimated that 98% of the population were killed. The Southern Song dynasty based at Hangzhou felt themselves safe beyond the natural defenses of mountains and rivers. 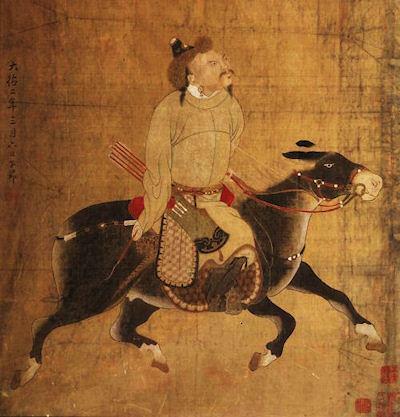 Although invincible on open plains the Mongol horsemen could not so easily launch attacks over the steep mountains and the wide rivers of central and southern China. The defeat of their foes, the Jurchen (Jin), in northern China did not seem necessarily a bad thing to the Song people. Indeed the Mongol invasion could have given opportunity for the Song to retake some land in the north. Meanwhile Genghiz's attention looked west to the Muslim kingdoms of Central Asia, which he then conquered. His vast empire stretched from Eastern Europe over most of Russia; Middle East and India. He could certainly claim that he ruled over most of the known world. Genghiz's death in 1227 while conquering the Western Xia kingdom (which covered present day Gansu and Shaanxi) gave the Southern Song a lengthy reprieve. Even Genghiz's death was bathed in blood, to keep his death a secret, during the long journey back to the Mongol capital of Karakorum anyone unfortunate enough to just see the funeral cortege was put to death. His son and then grandson relaxed the harshest of Genghiz's laws; so when Kaifeng fell in 1233 the lives of the millions of inhabitants were spared. In 1279 Kublai Khan, his grandson, conquered the Southern Empire and unified China. A lesson taken from these events was that a divided China could not effectively defend itself, the integrity of the nation's heartlands has been maintained from the Ming dynasty to the present day. The visit of the Venetian ➚ Marco Polo to China during the Mongol (Yuan) dynasty is widely seen as the first important contact between Europe and China. Although trade between Europe and China dates back into the Han dynasty, as the Romans are known to have imported vast quantities of silk contact was rarely direct. Transport over the Silk Route was in stages through Central Asian intermediaries, Europeans did not travel to China or meet Chinese people. It was the establishment of the Mongol dynasty in China that opened up access to not just Europeans but to all nations. The court of Emperor Khubilai was cosmopolitan; he trusted Europeans more than the native Chinese. 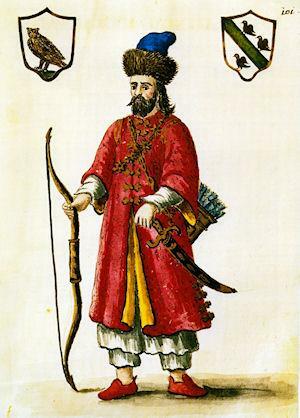 Marco Polo in Tartar costume. Source: Scann? de Coureurs des mers, Poivre d'Arvor. Photo by Grevembrock, available under a Creative Commons license ➚. Marco Polo was certainly not the first European to visit. The reason he is so much remembered is that the book describing his visit gained a wide audience, Europeans were fascinated to hear about this mysterious far away kingdom. Previous visitors had included Giovanni di Pian del Carpine ➚ in 1245 and William of Rubruck ➚ in 1253 who described the use of paper money, a novel concept to Europeans. 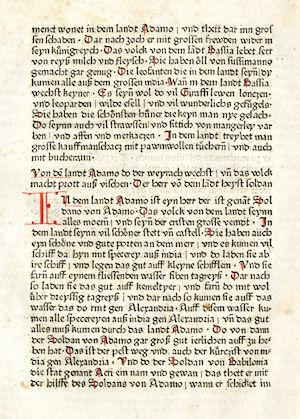 1477 translation into German of Marco Polo's travels in China. Photo by BSB ➚, available under a Creative Commons license ➚. Marco Polo's visit was far longer and better planned than previous visitors. Marco's father Niccolò and uncle Maffeo Polo traveled overland to China (1260-69) and were received by the Emperor, as merchants they were principally interested in trade. The Emperor was impressed enough to send them back to Italy with a request for the Pope to send him 100 European scholars. Soon after, in 1275, the brothers returned to China with Niccolo's 17 year old son Marco and all three spent 17 years there. Marco Polo describes the Emperor's court with an intimate portrait of the every day life. As well as Beijing and Xanadu he traveled to the previous capital of the Southern Song Hangzhou on the Grand Canal. He described Hangzhou as ‘The finest city in the World’. At the time the European name for the country was exotic sounding ‘Cathay’. He noted the animosity to the Mongol conquerors by the Han Chinese and learned the Mongol but not the Chinese language. On return to Italy he was imprisoned by the Genoese ➚ and it was while in prison that he dictated his book, the ‘Description of the World’. It was widely printed in many editions and languages and promoted a lot of interest and speculation throughout Europe about this vast, rich country far away. Many believed at first that the book was pure fiction as his descriptions were so fantastical. “There were all kinds of goods in its market and more than 1,000 cartloads of silk were shipped into the city each day. No city in the world could be compared to Dadu in terms of the unusual goods from foreign countries and goods in general that were available”. When Marco Polo was released from prison in 1299 he went back to Venice to continue the family work as a merchant, he became a wealthy man by these efforts but did not go on further grand journeys. He died in 1324 aged 70. Marco Polo was followed by many more European travelers to China, perhaps most importantly the Jesuit mission under Matteo Ricci. With the fall of the Mongol empire the lasting effect of Marco's visits on China was minimal as his contact was with Mongols not native Chinese. However in Europe the tales of his visit did stimulate long-lasting interest for the Far East with the allure of an exotic and wealthy land far away. Over the next five centuries many an adventurer was inspired to go East and seek their fortune. Lugou Qiao bridge Beijing is better known as the Marco Polo bridge. 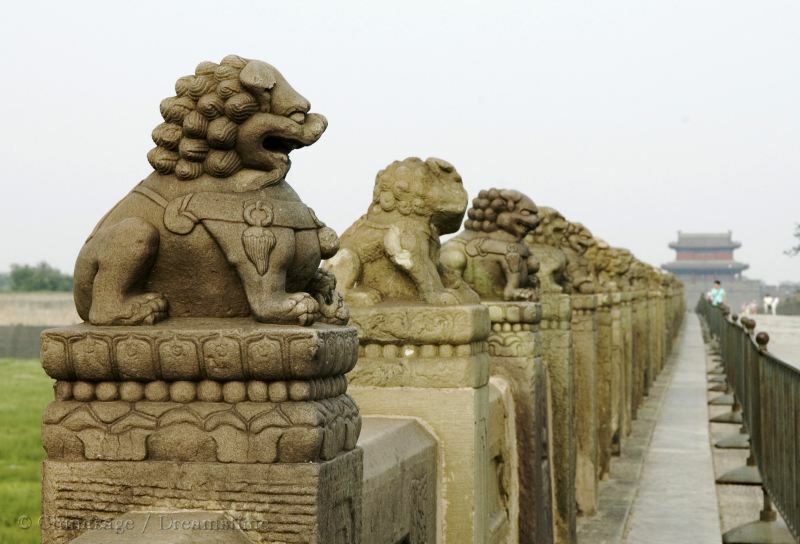 Decorated with 485 individually carved lions it was first built in 1192. At one time it was the main route into the city of Beijing. A bridge in Beijing was named in his honor - the ‘Marco Polo bridge’. It is called in Chinese Lugou bridge 卢沟桥 and was built in 1189-92; it is an impressive 874 feet [266 meters] in length. It was described and admired by Marco Polo and so European travelers named the bridge after him. The bridge was the scene 700 years later of the opening skirmish of the Japanese occupation. 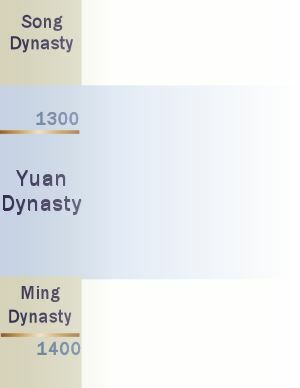 Citation information for this page : Chinasage, 'Yuan (Mongol) Dynasty 1279 - 1368', last updated 7 Feb 2018, Web, http://www.chinasage.info/dynastyyuan.htm.